Fujifilm X-T10 is pretty much a resemblance of Fujifilm X-T1 that is more pricey yet coming with some extra features. Fujifilm X-T10 is a popular choice among dedicated photographers that have budget around a thousand bucks. Along with Fujifilm X-E2, these mirrorless camera models offer decent qualities, convenient usage, and very compact body design. Fujifilm X-T10 and Fujifilm X-E2 are priced very similarly; which one should you get? On the following article, we will take a look first at how these cameras are similar and what key aspects that make them different. Both Fujifilm X-T10 and Fujifilm X-E2 can do exceptionally well even in a bad lighting condition. These cameras are armed with built-in flash and external flash shoe, so they do have good edge for taking good quality images in dark places and minimum light environment, either you are photographing at night or on a lake in a cave. They are also excellent for HDR photography as they come with AE Bracketing feature. Both of them are armed with 16MP Trans-II CMOS sensor, so they can generate similar image details and sharpness. Fujifilm X-T10 and Fujifilm X-E2 can also record Full HD 1080p videos at a frame rate of 60 fps. To ensure that you get high-quality audio in the file, each of them has a microphone port. These models have electronic viewfinder for the sake of more precise framing and control. Both models support wireless connection for easy data transfer. 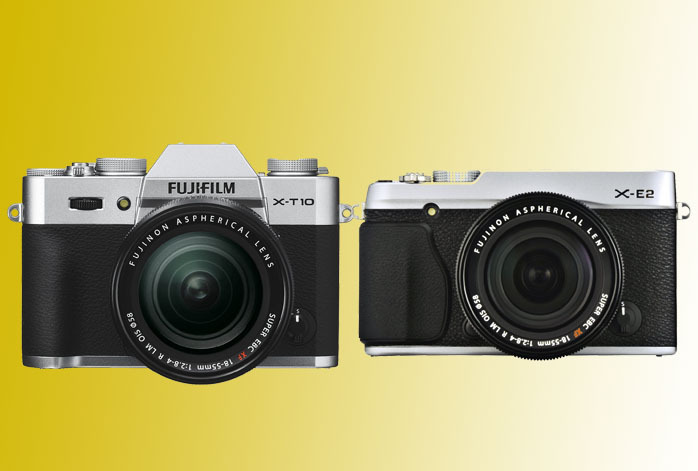 Find out: Fujifilm XT10 vs X100T. Fujifilm X-E2 has some advantages over Fujifilm X-T10. It has a higher LCD screen resolution, so it can preview images more accurately. It is also a little bit lighter, and it has a longer flash coverage (7m vs. 5m. Thus, Fujifilm X-E2 can be slightly better in lighting for taking pics in tough conditions. It also has a better durability in continuous shooting because Fujifilm X-E2 can take more JPEG pictures before needing a break (18 photos vs. 10 photos). However, Fujifilm X-T10 has more strong points that can make it better than Fujifilm X-E2. It has an articulating screen, so you can shoot from more flexible positions with it. It also shoots faster in continuous shooting mode, as it has an 8-fps photo burst (Fujifilm X-E2 only has 7-fps photo burst). Fujifilm X-T10 do have better overall performance than Fujifilm X-E2 due to having more focus points, higher maximum shutter speed, and much higher maximum ISO. Thus, Fujifilm X-E10 can capture more details and can be better for taking pics of fast-paced actions. Fujifilm X-T10 has more advantages than Fujifilm X-E2. In general, it has better performance and can produce better image quality, especially when snapping pics of moving objects. Therefore, you should choose Fujifilm X-T10.